When a commitment to add to your family by adopting a furry forever friend is made, it comes with responsibilities. Adopting a puppy or adult dog, is a process which needs patience, but with that patience comes much reward and love for a lifetime. To schedule a training session(s), please contact trainer@gulfcoasthumanesociety.org or call 239-332-0364. GCHS offers help in that process to make your furry friend a well-behaved dog. 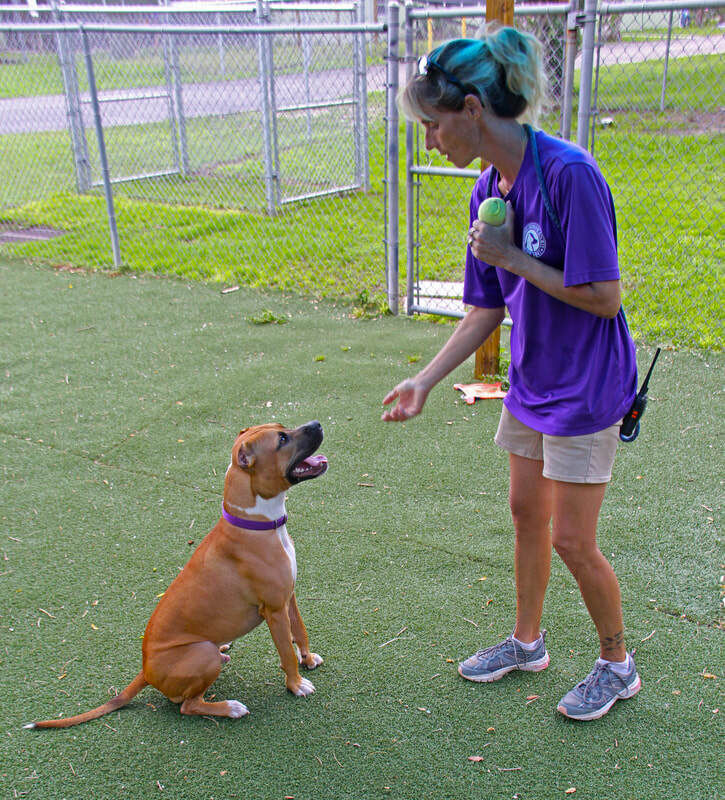 Joy Kolecki is a dedicated GCHS staff member and certified dog trainer, who has formidable experience in dog training. Pet owners can be reassured their furry friends are in good hands with Kolecki and her ability to make your dog's behavior the way it should be - loving and obedient. Kolecki is also offering PRIVATE LESSONS. If you're looking for a one-on-one training session or do you have a pup who has certain behaviors you want corrected? Let's spend some time together improving your furry friend's behavior in this one-hour session. Private Lessons are also available for $60. This is a one-time class directed by Kolecki at the GCHS campus. It is for specific behavior issues. To make an appointment for a private lesson, contact Kolecki at trainer@gulfcoasthumanesociety.org. Puppies have lots of energy and will be depending on their new owners to raise them correctly. This class will feature how to teach the right behavior to your blossoming puppy and how to deal with the "terrible two's". Your puppies' obedient behavior will be improved by being taught how to read their body language, teach how to correct mouthing behavior, potty training, crate training and more! Puppies go through different phases just like us. This is a great time to learn about new behavior, the puppy teen years, focus, leash walking, chewing, body language, basic manners and more. This is a class to help improve or correct behaviors, basic cues (sit, down, etc. ), walking on a leash. So if your four-legged friend needs manners, this is for you! Can we help you with an issue you are having with your dog? Is there something specific you would like to work on and feel you're not getting anywhere with it? Our private lessons are just the thing for you.